OH MAN this is going to be crazy. Not too sure whats going on the Lai-Lai Jewels though. Seems it could be the first 3000 ordered or something. Seems like they are in fact reusing the Legacy Thunder Megazord mold, but man what a difference do those extra paint apps make. Actually its a rework of the older mold thus the "DX" used in the product description etc. I heard this rumor about a month ago on facebook. I am not interested. I am content with the Legacy edition. I'm not spending early $200 for a diecast metal full paint app version of the original toy when for the same price I can get what I already have: a far superior legacy toy. And rarely do I say the Bandai America's legacy line is superior but in this case it is. It's one of my favorite figures. I glad to hear that it the original DX. I be getting this it looks really cool and much better than the one with the stickers. I was very disappoint with the legacy one with all the problems it had and how small it was. I hear it's if total orders reach 3000, then the Lai-Lai jewels will be included. I'm pretty happy with my Legacy on and since I don't have a direct connection to Dairanger, don't really feel it necessary to pick this up too especially not at that price. Haha. Every Legacy figure has problems. But compared to the rest the Thunder Megazord is a shining beacon. Yes the paint scratches easily on the elbows. Yes it should have ankle articulation for better stance. Yes the fire bird needs metal rods to secure the wings. And yes the zord builder ports are annoying and out of place but they are kept hidden and unused when in Thunder Megazord mode. But the molding is slim, beautiful, and show accurate. The detail is pristine. The paint job over all is astounding. It's a majestic samurai mecha. The red dragon thunderzord is a crimson sunset of beauty. The other thunder zords are crafted by the heavens themselves. It's the closest Bandai America has ever gotten to Soul of Chogokin level. Dare I say this is the definitive DaiRen'Oh. And as for small? It's the largest Legacy Megazord so far and stands taller than the SoC Voltron. 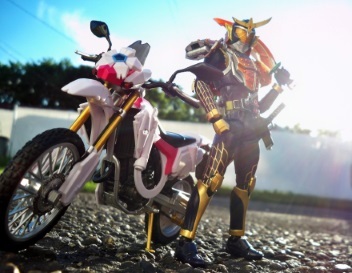 They should make a Soul Of Chogokin Dairenoh. I second this. It be more fun to have than the DX.